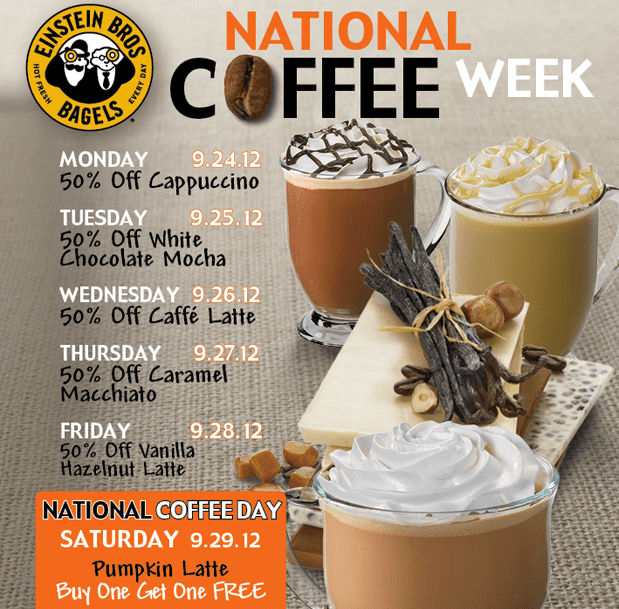 Einstein Brothers Bagel: 50% off select speciality drinks throughout the week & buy 1 pumpkin latte and get 1 free on Saturday, September 29th. For more information and coupons, please click here. McDonalds: Free Small Newman’s Own Organic Coffee available now until Saturday 9/29 all day long. No coupon or purchase necessary. Krisy Kreme: Receive a 12oz house blend coffee free on 9/29. No coupon or purchase necessary. 7 Eleven: Free large coffee, cappuccino, latte, or tea (while supplies last) between 6 a.m. to 10 a.m. for CofFREE day at 7-11 on Friday, September 28th! (A day before National Coffee Day!) No coupon or purchase necessary. Dunkin Donuts: 99 cents for small hot (10oz) or iced latte (16 oz) with coupon valid until 9/30/12. Find five more coupons here. What coffee promotion are you most looking forward too? !